I was recently given the opportunity to review a few products from the new Evolve hair care line, available at Wal-Mart. These were some really great products! 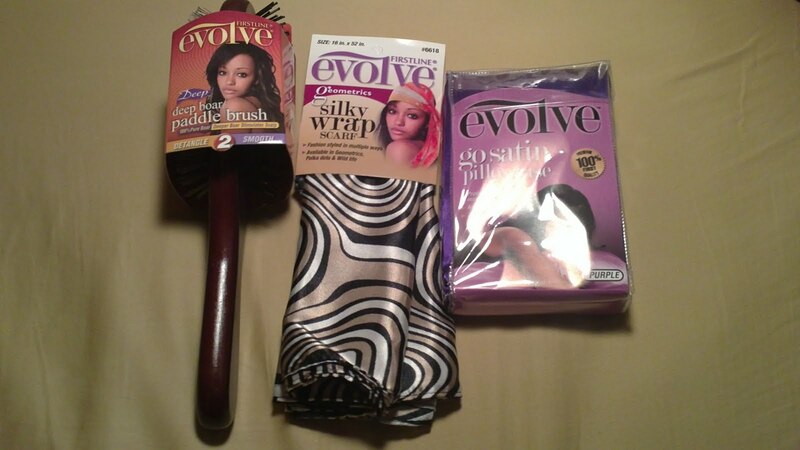 I received a Go-Satin Pillowcase, Deep Double-Sided Styling Brush, and Silky Wrap Scarf. The Go-Satin Pillowcase is fabulous! Designed to prevent hair breakage during sleep, I really like this pillowcase! It also allows your hair to retain it's natural moisture. It's so much more comfortable than wearing a nightcap. The Double-Sided Styling brush has one side with natural boar bristles, and the other side is plastic bristles. The boar bristles work great for my little sister's hair, and really smooth her hair down well. I really like using the plastic bristle side for my hair, as it detangles and works great for styling. "Established in 1986, Firstline is located in Houston, Texas, in the heart of one of the largest shipping ports in the world for timely global delivery. Our products are the finest quality, our customer service is first rate, and our prices are highly competitive. - We are currently designing new products that offer increased styling opportunities to ethnic consumers. - Firstline supports the individual efforts of every one of our customers and knows that understanding the nature of each customer's business allows us to “tailor fit” a marketing program that most effectively drives increased traffic into each customer's stores. - We are the premiere company in our industry, providing a complete line of high-quality, branded styling essentials that include brushes, combs, and textile hair accessories." Disclaimer: I was not monetarily compensated in any way for this post. All thoughts and opinions are mine. All quotes taken from the Firstline Mfg Company website. I love Pureology Products! They are the best and always have my hair looking healthy.